The journey from Cambodia to Vietnam was awful. I could write a whole blog post about reasons why I hated it. 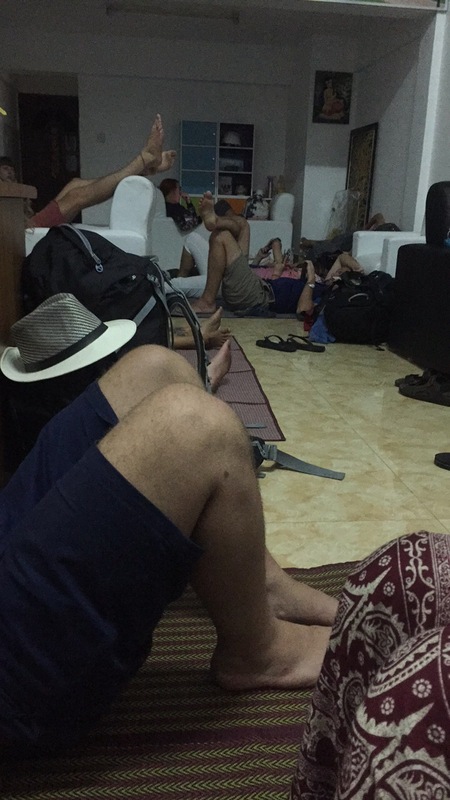 We had a sleeper bus from 6.30pm-1am from Sihanoukville to Phnom Penh which wasn’t too bad but it was too early to sleep and I was so worried about not waking up when we made a toilet stop. I slept a little but not much. We then spent 1am-6am lying on the hard floor of the bus company’s office. With my back issues I didn’t sleep a wink and just got miserable. The next bus was 6am to 1.30pm and that was just as bad. The seats were uncomfortable and mine didn’t recline as it was broken and the drivers just generally pissed me and Ammun off. For the border crossing, they took our passports and did everything for us so we were confused about what visa we had and we don’t like giving our passports to people. The underneath of the bus was also wet and muddy so my bag was disgusting, my trousers and knickers became wet and my top became wet and muddy from carrying it. Not impressed even the slightest. After we got ourselves some Vietnamese Dong and checked into our hostel, we headed straight for our happy place: Burger King! Ive never eaten a burger and fries so fast – I was so hungry! 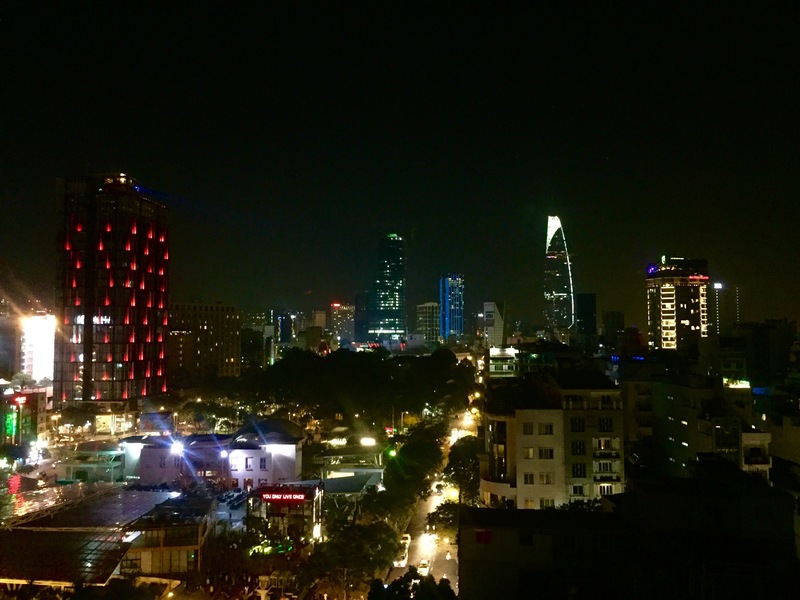 Then, as I hadn’t slept since the first bus and Ammun is basically sleeping beauty, we went back to the hostel to have a rest and make some plans for our few days in HCMC. 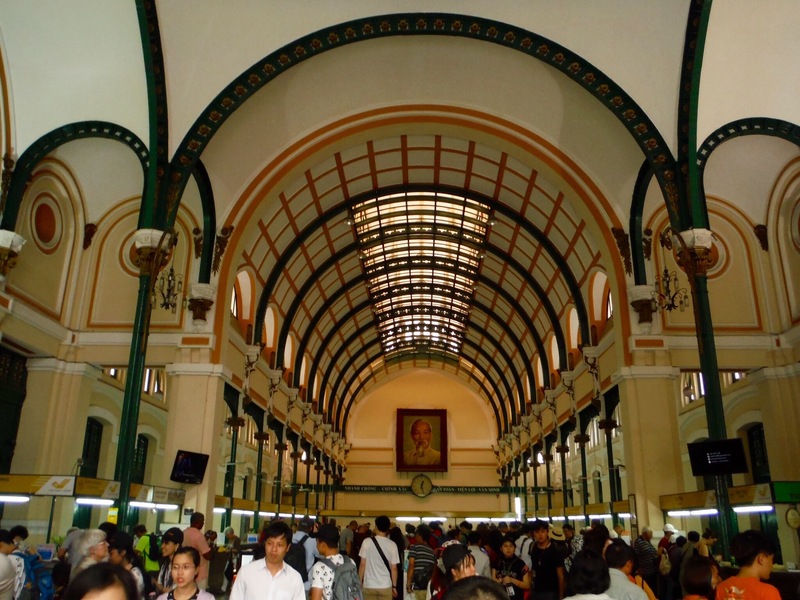 As we didn’t have much time left of the day at this point, we decided to just go to Ben Thanh Market. We took a nice walk through the park to get there where there was live music, badminton courts and more. 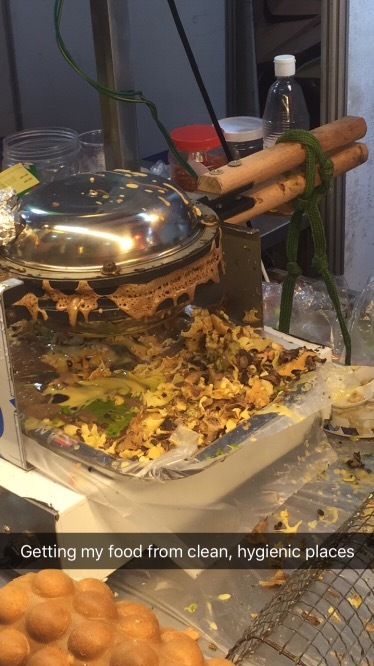 Sadly, we didn’t check the opening times and this is just a daytime market. 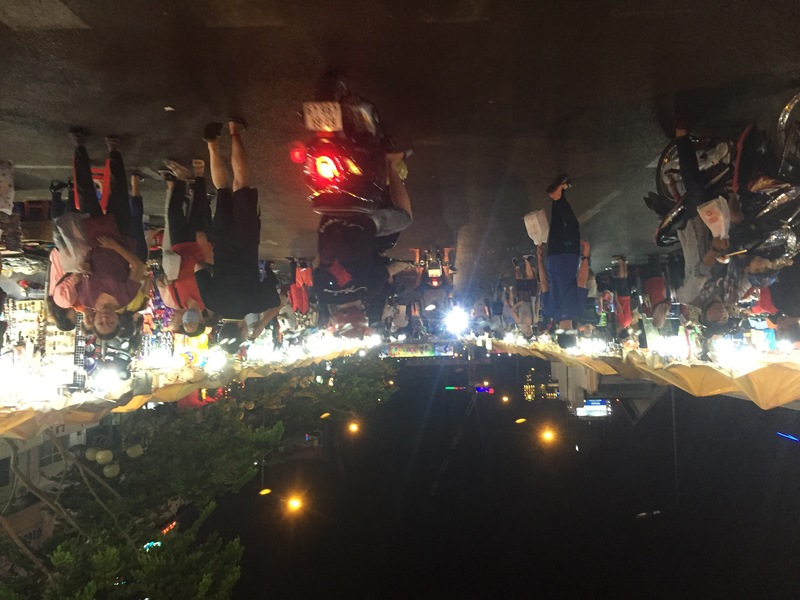 Luckily, the night market had set up either side so we had a look at our first Vietnamese market. Obviously there’s a lot of tat but there’s also a lot of really nice stuff and I want to buy it all!! That night I slept so well! We rolled out of bed and had some eggs for breakfast and then headed out for our own self guided tour using the Sygic Travel app. You put in all the places you want to go and a starting point and it plans out the best route for you as well as giving you information on each place. 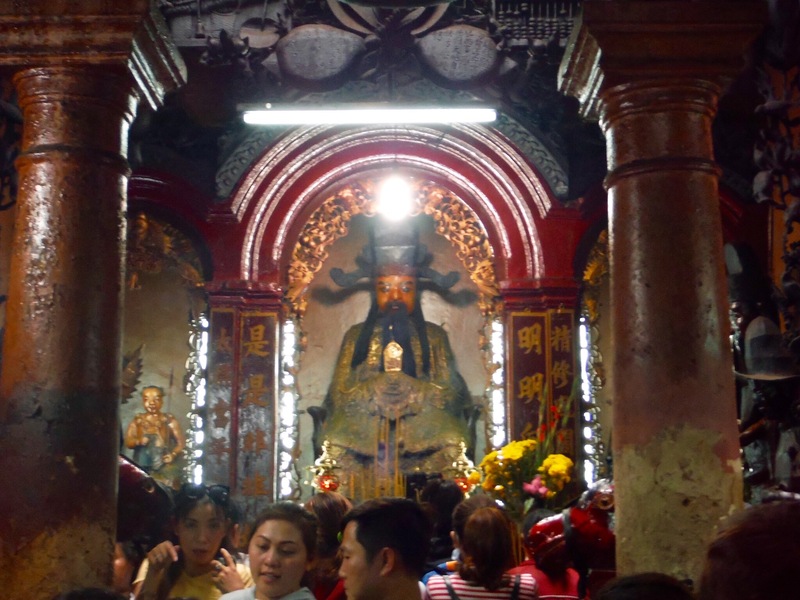 Our first stop was the Jade Emperor Pagoda. The pagoda is free to enter but not vey tourist friendly. 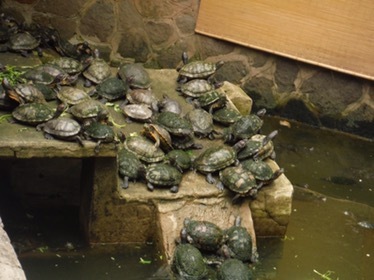 It was made by the Chinese community in 1909 to celebrate Taoism and is also known as the tortoise pagoda as there is a big pond full of them. 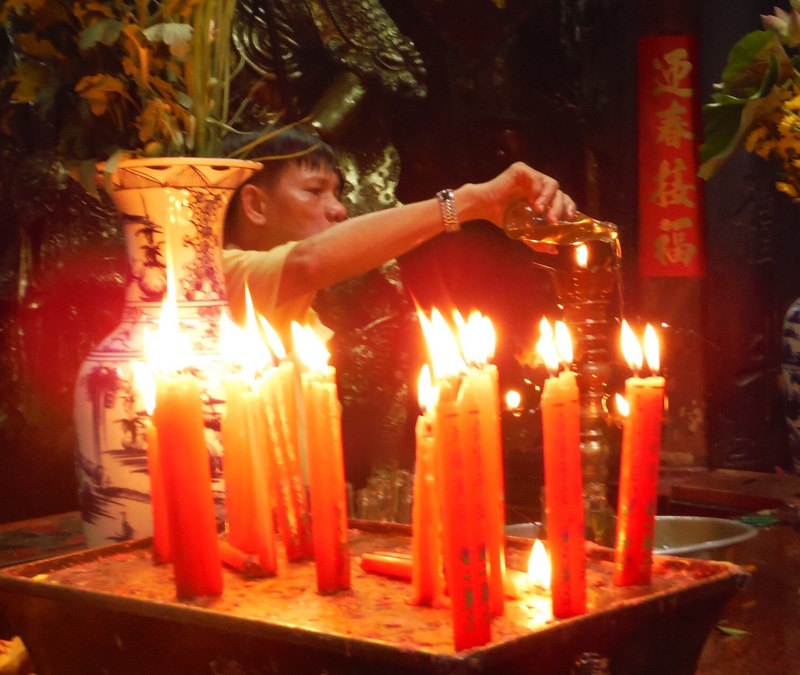 The place was rammed with people praying and everyone prays with incense sticks so the place has quite a strong smell. 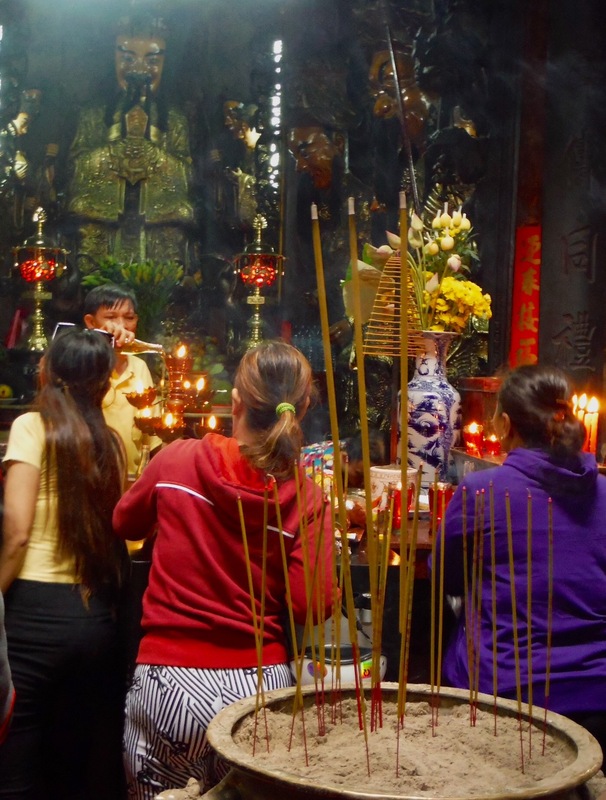 It was hard to take photos with so many people around praying (in quite a frantic manner as well) but we saw the main room with a guy blessing people, then a secondary room and then an offerings room. 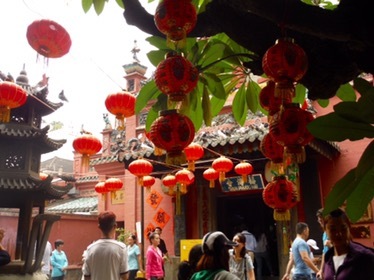 There was a lot of red which symbolises joy and prosperity in China. 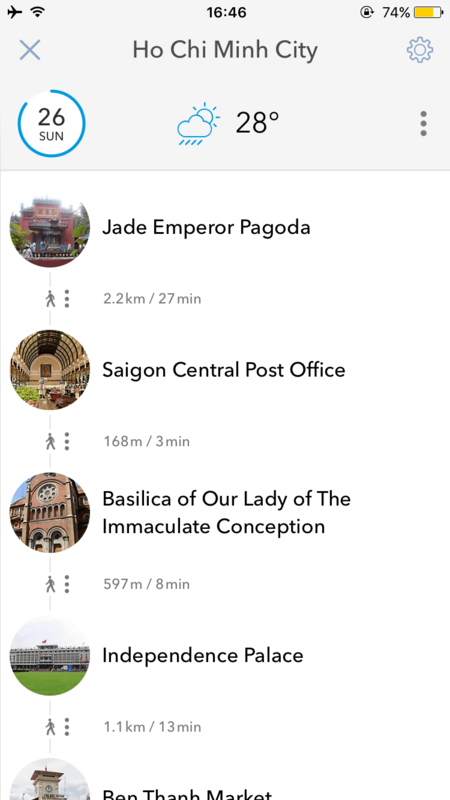 After this we got a taxi to Saigon Central Post Office and the Basilica of Our Lady of the Immaculate Conception which are right next to each other. 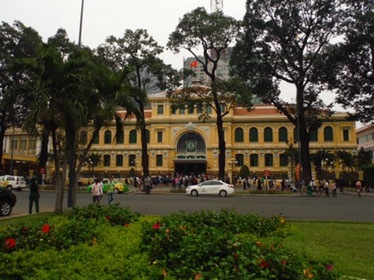 The post office was constructed when Vietnam was part of French Indochina in the late 19th century. It was designed by Alfred Foulhoux, but is often credited as being the work of Gustave Eiffel. 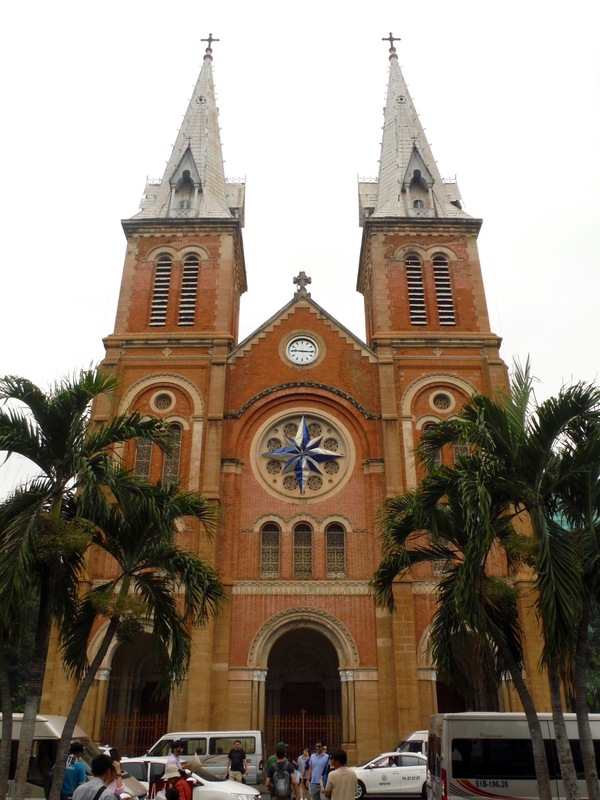 The Basilica was established by French colonists who initially named it Cathédrale Notre-Dame de Saïgon when was constructed between 1863 and 1880. It has two bell towers, reaching a height of 58 meters. 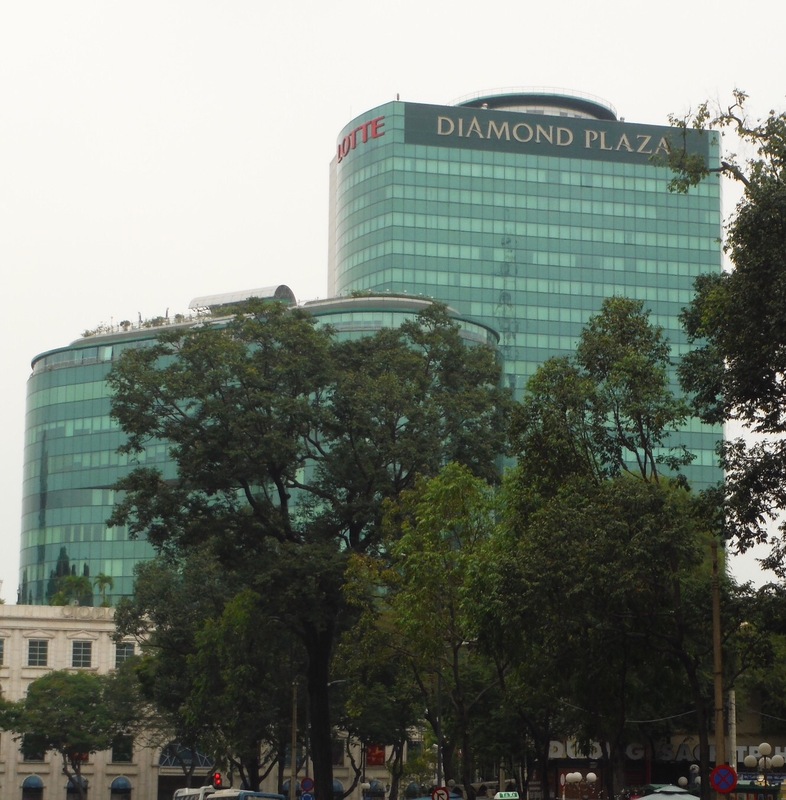 From here we could also see the Diamond Plaza which is one of HCMC’s many shopping centres. This one is 22 storeys high!! Next we stumbled across a little street of nothing but cute bookshops and book cafes. Most of it was in Vietnamese but there were some international books too. I was surprised to see quite a few Don Quijote books – I know it’s really famous in Spain but I wasn’t sure how far it would spread across the world! 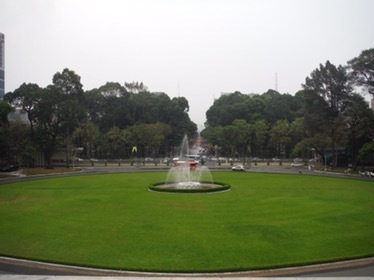 As the clouds loomed, we walked to the Independence Palace which was the home and workplace of the President of South Vietnam during the Vietnam War. 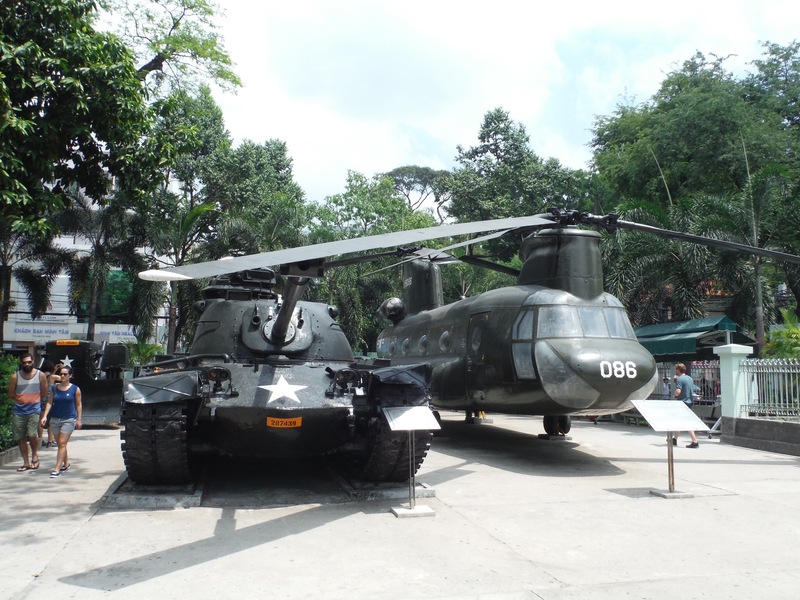 It was the site of the end of the Vietnam War during the Fall of Saigon on April 30, 1975, when a North Vietnamese Army tank crashed through its gates. 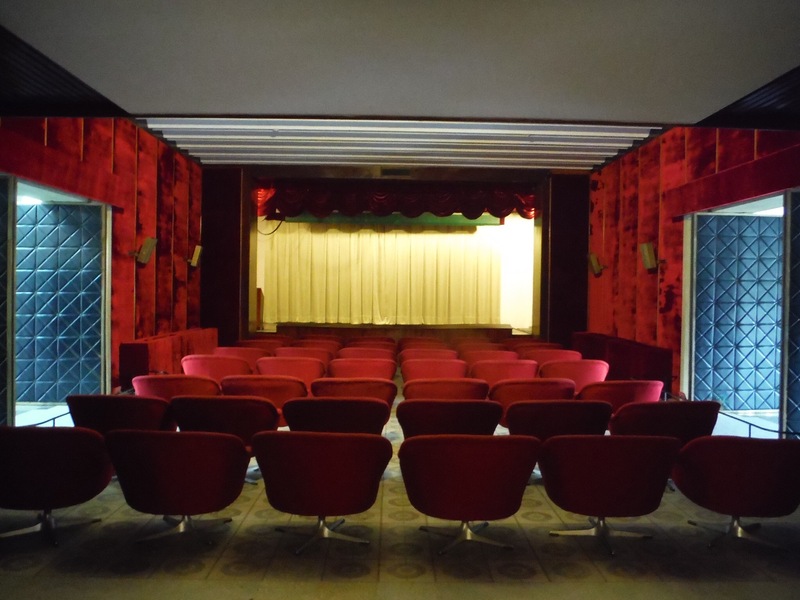 All the decor is very 60s (and kinda ugly, sorry!) and you can tell that it was built for a war. 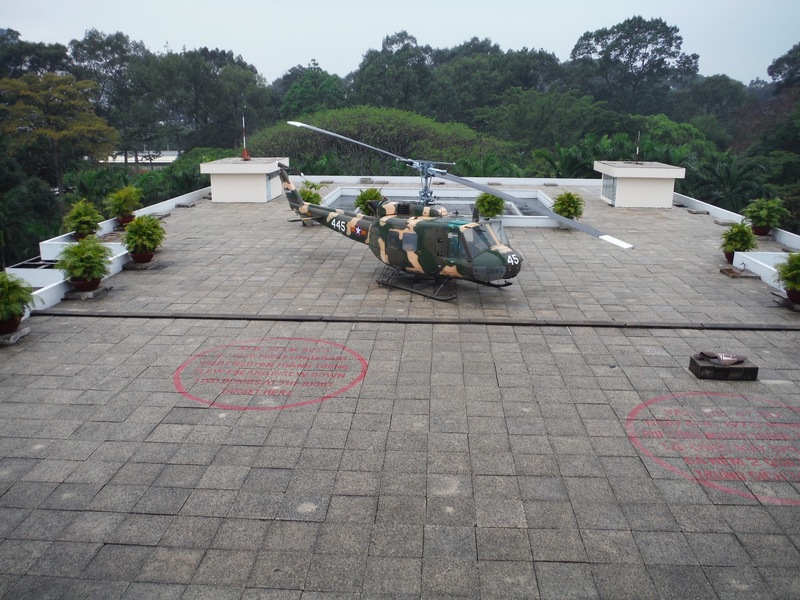 We visited all the main, important rooms and all the leisure rooms like the cinema and games rooms then from the roof we could see the helipad and marks where 2 bombs once hit the centre of the building. 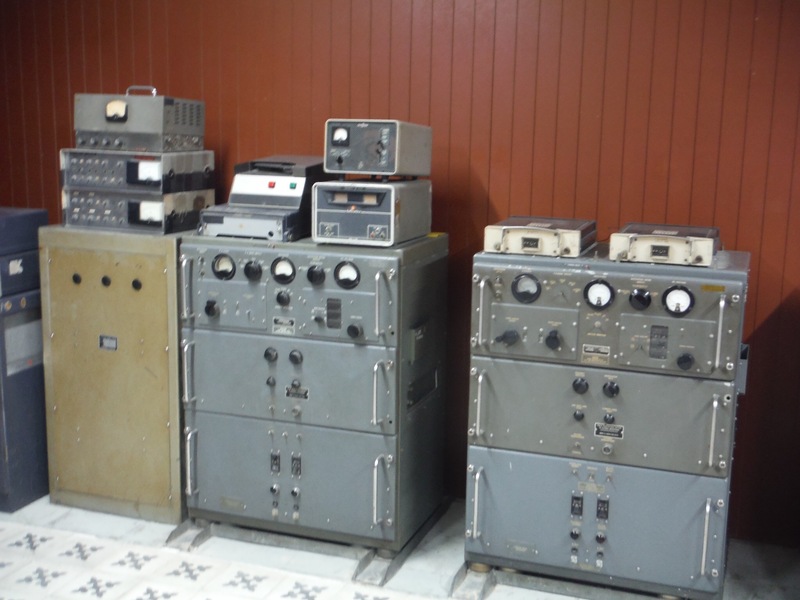 We then went all the way down to the basement/bunker which had lots of maps, telephones and communication devices. 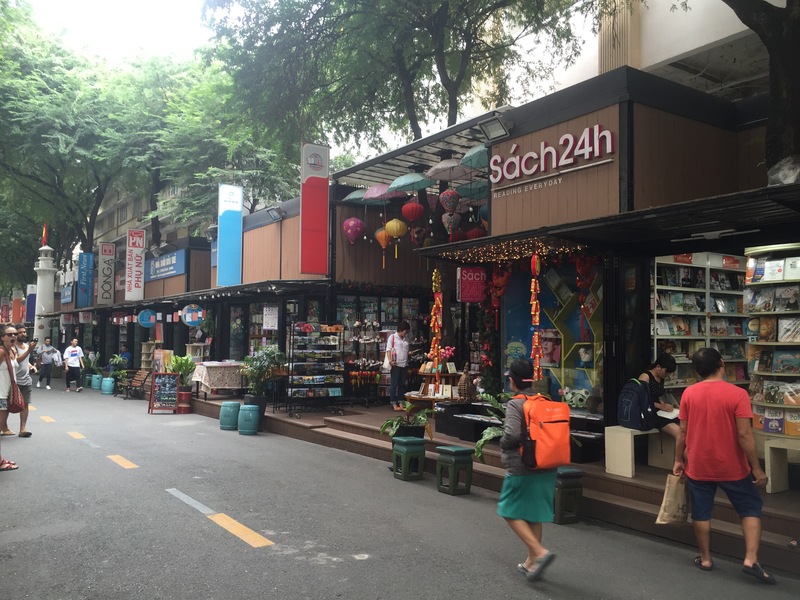 Luckily the rain cleared up as we finished and we walked down the road to Ben Thanh Market again. 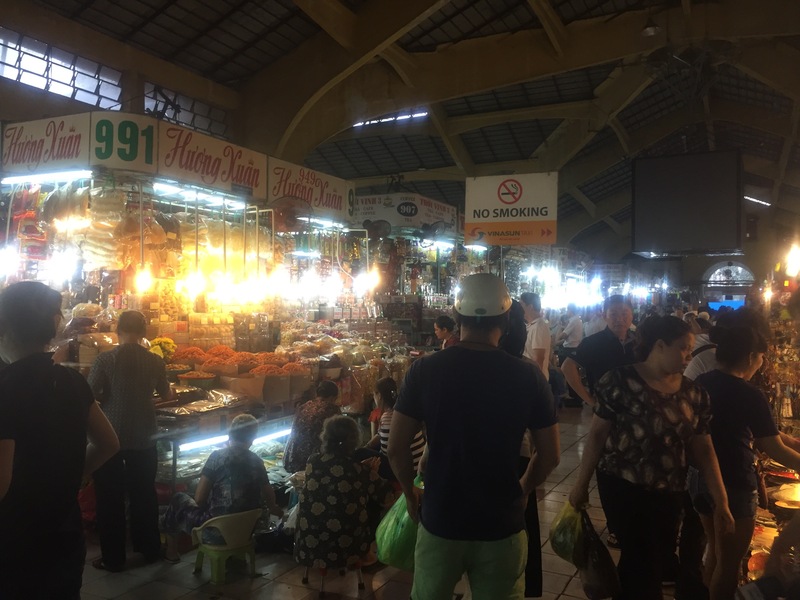 Before we reached the main market, we found the food court and enjoyed some street food to the sound of the whole of one of Taylor Swifts old albums. I had some yummy noodles and Ammun finally got some Indian food that she had been craving for ages. 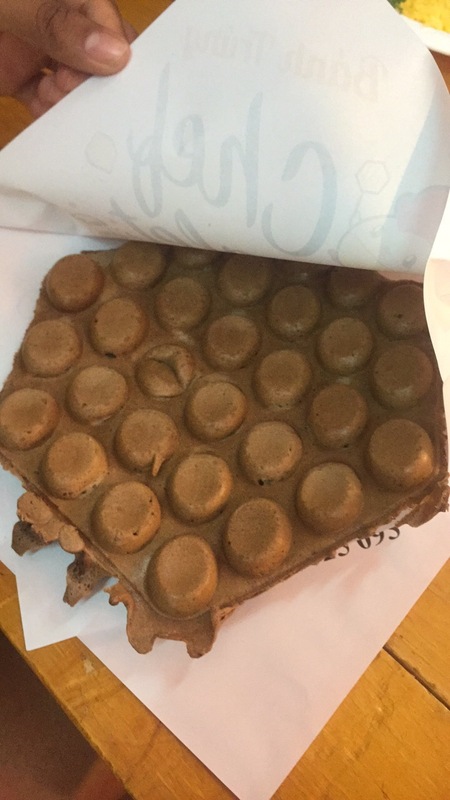 When I was paying for my food my heart suddenly dropped and I thought I had lost a 500,000 dong note (about £18). I searched my purse hard for it and tried my best to remember whether I’d put it in or left it in the hostel. I found Ammun and she was also in a bit of a tizz about how she had managed to spend so much money in just one day. We did some maths and worked out she was also 500,000 dong short. Then we remembered our taxi journey earlier in the day. The taxi man had shoved his hands into our purses before we even had a chance to work out the money (because it can be confusing and a lot of sellers offer to help you count). He had obviously done some kind of trick and stolen the biggest note possible from each of us. I was so angry. £18 isn’t much but it would get me so far in Vietnam. Warning to everyone in Ho Chi Minh: don’t let people anywhere near your purse/wallet!! After lunch we hit the market for some real shopping. The market was huge! There was everything from food to clothes to souvenirs to furniture! We stayed for a while and had a thorough browse and picked up a few bits. Our last two stop we had saved for after dark. 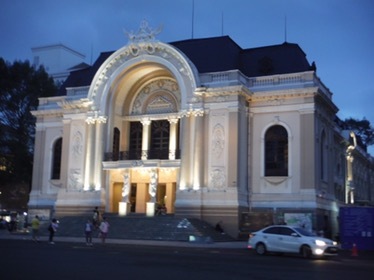 The Saigon Opera House, built in 1897 and Ho Chi Minh City Hall, built in 1902. 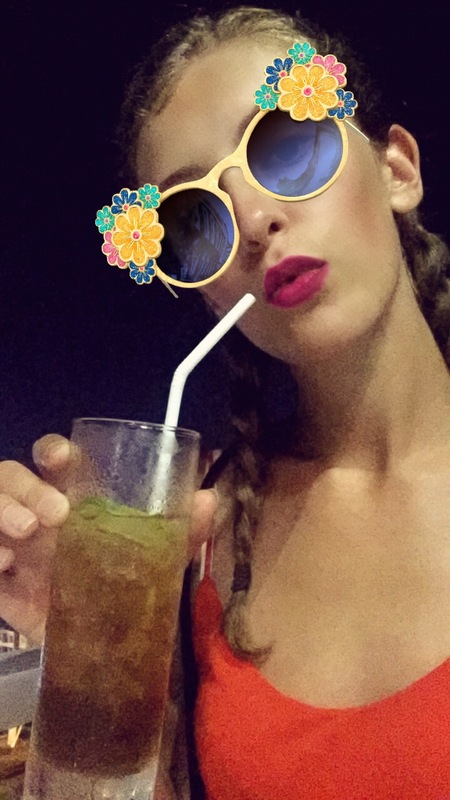 After our busy day we decided to treat ourselves to rooftop cocktails at the Sky Bar at Elior Hotel. Sadly the busy day didn’t end there as we realised that the route we wanted to take was way more effort than it was worth so over two (pretty weak) cocktails, we did lots of planning and rearranging of our plans. Eventually we reached a conclusion about how we want to do the rest of Vietnam and treated ourselves to mozzarella sticks at Burger King on the way back to the hostel. 2am, Ammun had gone to bed not feeling well and I was finalising our flight, hostel and airport pickup. The next day we had the morning to play with before our flight and I was really up for going to the War Remnants Museum. I’ve always been interested in wars which I find quite a weird thing to be interested in as they cause tragedy for so many people. 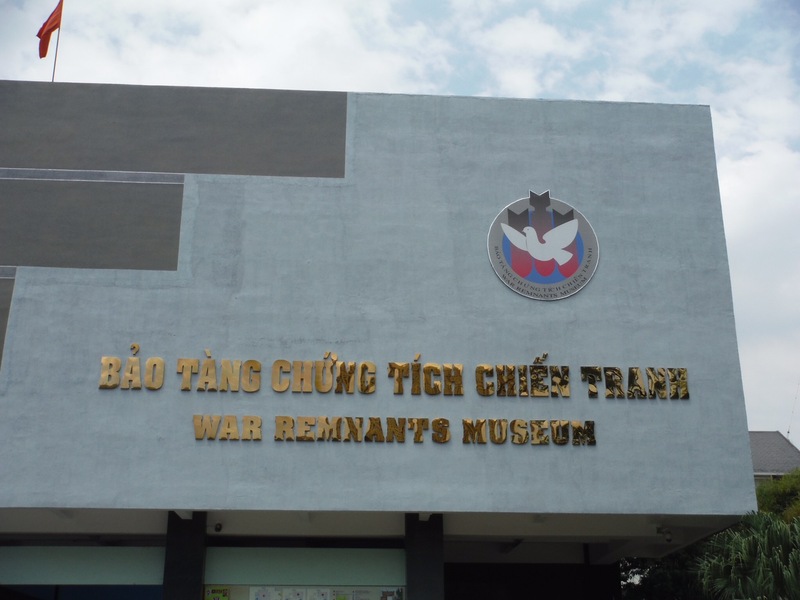 There are many museums and war museums around Vietnam but I’d read that this was the best one and I was hoping to learn more about the infamous Vietnam war that I knew very little about. Sadly, it turns out that it shuts for siesta from 12-1.30 so we had to power through it in just over an hour but I could have spent hours there. 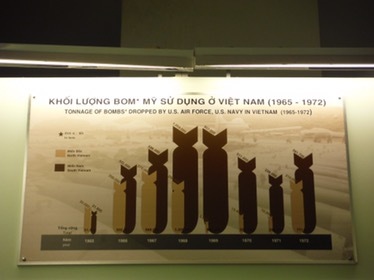 I learned a little bit more about Vietnam’s war history in the first room and saw how much The USA was involved in supplying troops and weaponry. Yet somehow there was nothing telling me how or why the Vietnam war started and how or why The USA got involved. The next two rooms we went in were photo galleries. They are well put together collections of war photos from 133 photographers from all over the world. At the beginning, someone is quoted for saying that war photographers are heroes too because they show the common person things that they can’t even imagine. 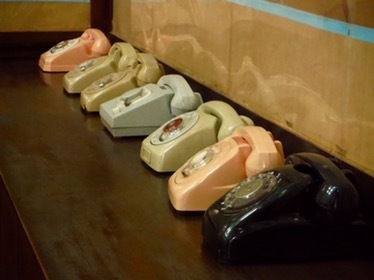 Photos document the horrors caused by humans and warn us in the future. 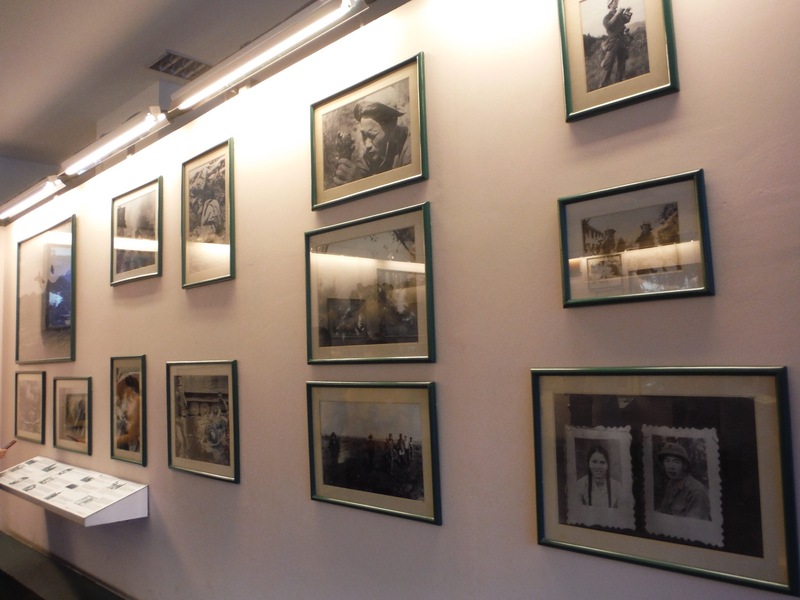 The photos showed a wide variety of things like portraits of the photographers before being killed at war, vehicles like tanks and helicopters and soldiers using the large guns etc. 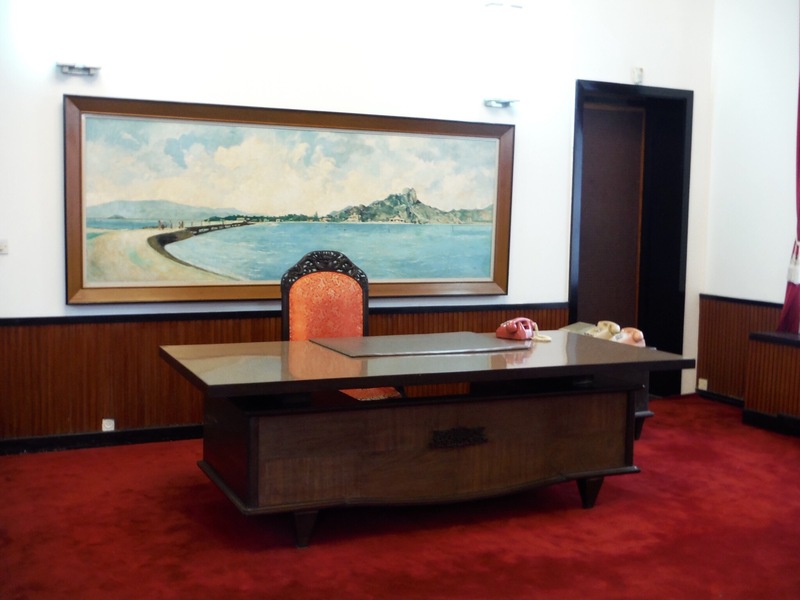 There were also a lot of pictures that I would describe as being worse than those in the S-21 museum in Phnom Penh. There were men being tortured, village people after being massacred and pictures of people who had been hit by land mines. One picture in particular I don’t think I will ever forget and I don’t know how to describe how mutilated this body was. 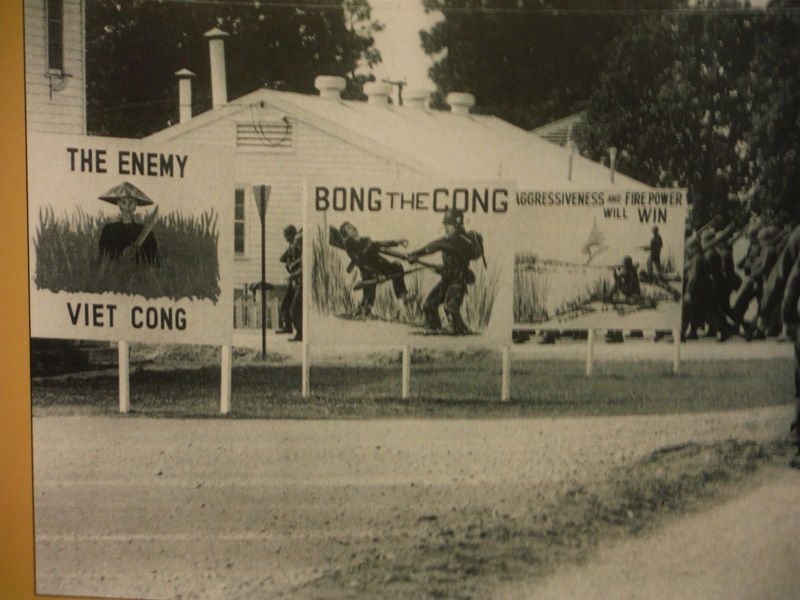 Of course there was the famous picture of American troops chasing children out of their village with a girl in the middle, naked because her skin was burning from the Digoxin. Digoxin is the most dangerous chemical currently known to man and the fourth gallery that we quickly ran into before we were kicked out was all about babies that had been affected by this horrible chemical. In some pictures, these people were smiling and clearly able to live a reasonably normal life but others were so disabled that I couldn’t even tell from looking how they did the most basic things like eating as drinking. One photo make me smile but equally broke my heart was of a 28 year old man having a bath like he does every three days. He had the biggest smile ever but the description said that is the only time he ever smiles. We left feeling very solemn once again and as we walked out past all the American planes etc, I felt very confused. I still don’t really understand what happened in the Vietnam war and what’s more, I really don’t understand how The USA got involved and killed and massacred so many people. I know some people join the army and do good things but it baffles me that someone can join the army, kill women and children and innocent men and be okay with that. I also felt angry that someone had got hold of the world’s most dangerous chemical and used if for evil. This is the kind of things that should be happening in movies, not in the real world. We cheered ourselves up by going to a cute cafe for a drink and some lunch before heading to the airport. 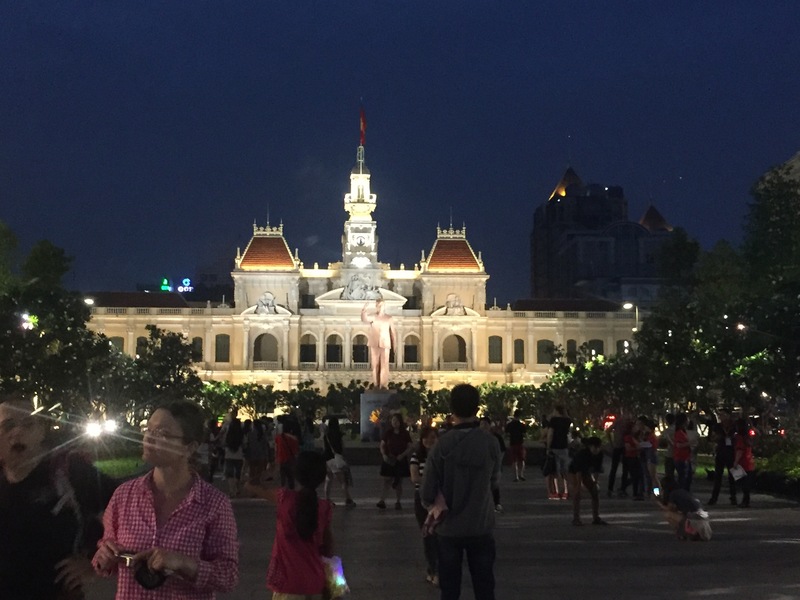 Ho Chi Minh has really given us a bit of everything. We’ve had history, modern architecture, tasty food, great shopping and we’ve dodged more motorbikes than Average Joe’s Gym has dodged dodgeballs!! Hoi An and Hue. Exploring Central Vietnam.